I have two good news regarding my book today: first and foremost, it's nearly finished. I just send the last but one chapter to my reviewer and will start to work on the very last chapter in some minutes. This also means [second news ;-)] that I can now reveal the currently planned release date for this book: April, 5th 2002. - Regarding WSDL again: Sam just showed a brilliant attitude towards this subject: "having developers code SOAPAction and endpoint information directly into their logic seems so twentieth century". Well, I agree! 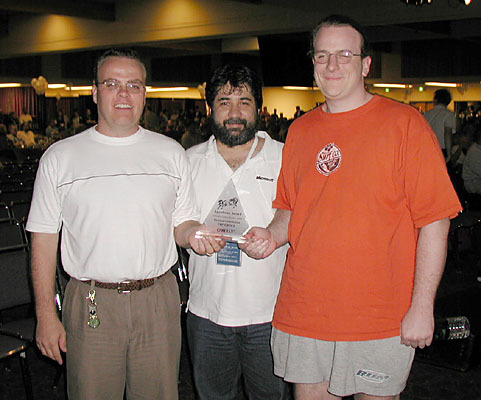 It looks like Sam's probably the only guy who'd attend a Java conference with this shirt (he's the one in the middle). Regarding yesterday's link to http://www.cetus-links.org/. Regarding yesterday's link to http://www.cetus-links.org/. I checked out some of their categories and somehow it seems that their content to noise ratio really is great. As I'm currently working on the last chapters of my book, I wanted to reveal the fact that I'm not really working alone. Here you can see the most recent photo of my one and only co-author right after he finished checking his emails. Dave recommends to "[...] check out the Linux Advocacy Mini-HowTo. Everyone who is promoting a cause can learn from this excellent HowTo". I agree, especially with the last point: "Finally, keep in mind that we all have infinitely more important issues to deal with than the selection of a computing environment.". I guess we sometimes tend to forget this. For all of you who want to know what WSDL is about, Sam published A Busy Developer's Guide to WSDL 1.1. Even though he focuses on the integration with Radio, this is a good read for anyone who wants to get a hold on this abbreviation without reading dozens of pages of specification. It only takes about 5 minutes to read and this time really isn't wasted! As some of you know, I've been offline (a.k.a "out-of-town) for the last three days. Now I found an excellent statement from Dave: "A note of congratulations to Microsoft and best wishes for a successful launch of Visual Studio .NET, tomorrow. We look forward to many years of happy interop." Wow! The only thing left to say is that I fully support this attitude. With all those great chances we're facing in regard to web services in the not-so-distant future, I don't really believe that "hell froze over", but instead that we might finally be able bury the hatchet which has been used as a base for religious debates among developers using other programming languages or paradigms. Finally, we can work together! I guess you better don't think about me as a romantic optimist  in this case ;-). I've "been there, done that" in a project that integrates C/C++, Java, Visual Basic, VBScript, PHP, ColdFusion and some others to form a massive system which leverage existing implemented application logic. This also allowed us to use the best programming environment for the given task without sacrificing the overall application architecture. Well ... I did it - so can you!